The Midnight Run is a yearly event founded by Inua Ellams, a graphic and word artist from South London. The first Midnight Run was held in 2008. The Midnight Run… was born from boredom. One night at a bus stop in London, a friend and I tired of waiting, tried to follow a bus route on foot. After six hours we had covered and drifted across London, from Battersea to Chelsea, Victoria, Vauxhall and the West End. Surprised at how fresh, I waited for a year and tried to the same thing in summer, for 12 hours, from 6pm to 6am, and The Midnight Run was born. 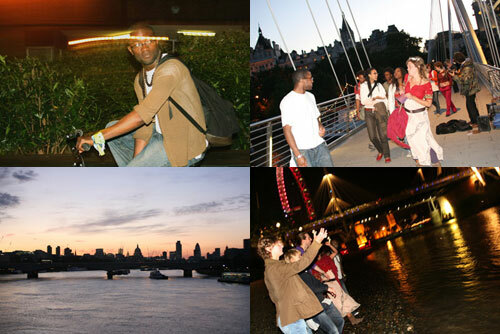 The first two runs 2006 and 2007 began in the west and ended on Waterloo Bridge, and the end will be kept as a tradition. My philosophy and why I hold the run is to reclaim the streets and the city as ours, to inhabit the confines of glass, concrete, steel and structure as child does a maze, with as much innocence, freedom and wonder as is natural.